Lung surfactants are instilled into the respiratory system of premature infants who do not have enough surfactant to ensure alveolar expansion. 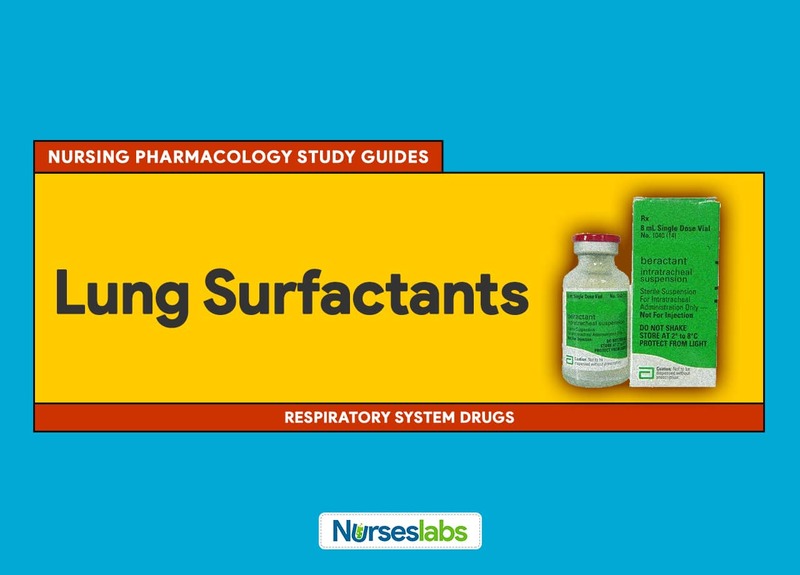 Learn about lung surfactants in this nursing pharmacology guide. 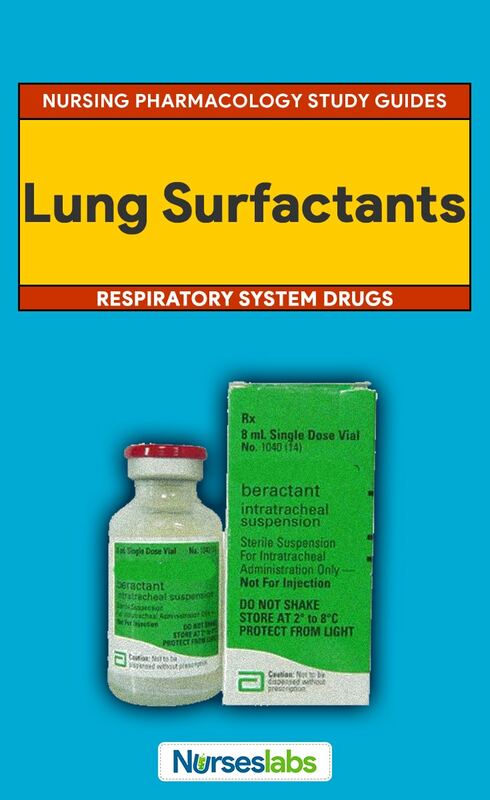 3 What are Lung surfactants? Respiratory distress syndrome (RDS) causes obstruction at the alveolar level. It is frequently seen in premature infants who are delivered before their lungs have fully developed and while surfactant levels are still very low. A surfactant is necessary for lowering the surface tension in the alveoli so that they can stay open to allow the flow of gases. If surfactant levels are low, the alveoli do not expand and cannot receive air, leading to decreased gas exchange, low oxygen levels, and generalized distress throughout the body as cells do not receive oxygen that they need to survive. Treatment is aimed at instilling surfactant to prevent atelectasis and to allow the lungs to expand. Acute respiratory distress syndrome (ARDS) is characterized by progressive loss of lung compliance and increasing hypoxia. This syndrome typically results from a severe insult to the body, such as cardiovascular collapse, major burns, severe trauma, or rapid depressurization. Treatment of ARDS involves the reversal of the underlying cause of the problem combined with ventilation support. Used to replace the surfactant that is missing in the lungs of neonates with RDS. Rescue treatment of infants who have RDS. Prophylactic treatment of infants at high risk for development of RDS (birth weight of <1, 350g, birth weight >1, 350g who have evidence of respiratory immaturity). This drug is being tried in the treatment of adult RDS and with adults after near drowning. These drugs are instilled directly into the trachea and begin to act immediately on instillation. Because lung surfactants are used as emergency drugs in newborn, there are no contraindications. Cardiovascular: Patent ductus arteriosus, bradycardia, intraventricular hemorrhage, hypotension. Respiratory: Pneumothorax, pulmonary air leak, pulmonary hemorrhage, apnea. Assess for possible contraindications and cautions: screen for the time of birth and exact weight to determine appropriate doses; because this drug is used as an emergency treatment, there are no contraindications to screen for. Perform a physical examination to establish baseline data for assessing the effectiveness of the drug and the occurrence of any adverse effects associated with drug therapy. Assess the skin temperature and color to evaluate perfusion. Monitor respirations, adventitious sounds, endotracheal tube placement and patency, and chest movements to evaluate the effectiveness of the drug and drug delivery. Evaluate blood pressure, pulse, and arterial pressure to monitor the status of the infant. Evaluate blood gases and oxygen saturation to monitor drug effectiveness. Assess temperature and complete blood count to monitor for sepsis. Decreased cardiac output related to cardiovascular and respiratory effects of the drug. Risk for injury related to prematurity and risk of infection. Ineffective airway clearance related to the possibility of mucus plugs. Deficient knowledge regarding drug therapy (for parents). Patient monitoring. Monitor the patient continuously during administration and until stable to provide life support measures as needed. Correct endotracheal tube placement. Ensure proper placement of the endotracheal tube with bilateral chest movement and lung sounds to provide adequate delivery of the drug. Review proper administration of drugs. Have staff view the manufacturer’s teaching video before regular use to review the specific technical aspects of administration. Suction the infant. Suction the infant immediately after administration, but do not suction for 2 hours after administration unless clinically necessary, to allow the drug time to work. Offer support. Provide support and encouragement to the parents of the patient, explaining the use of the drug in the teaching program, to help them cope with the diagnosis and treatment of their infant. Continue other measures. Continue other supportive measures related to the immaturity of the infant because this is only one aspect of medical care needed for premature infants. Monitor patient response to the drug (improved breathing, alveolar expansion). Monitor for adverse effects (pneumothorax, patent ductus arteriosus, bradycardia, sepsis). Evaluate the effectiveness of the teaching plan and support parents as appropriate. Monitor the effectiveness of other measures to support patient and stabilize the patient. Evaluate the effectiveness of other supportive measures related to the immaturity of the infant. Option D: Lung surfactant is instilled through the catheter inserted into the newborn’s endotracheal tube.Options A, B, and C: Options B, C, and D are not the routes of administration for this medication. Option B: Usually at this stage, the patient is working very hard to breathe and may go into respiratory arrest unless health care providers intervene by providing intubation and mechanical ventilation to decrease the patient’s work of breathing. Option A: Manual ventilation of the patient will allow you to deliver a FiO2 of 100% to the patient while you attempt to determine the cause of the high-pressure alarm.Options B, C, D: The patient may need reassurance, suctioning, and/or insertion of an oral airway, but the first step should be an assessment of the reason for the high-pressure alarm and resolution of the hypoxemia. To improve respiratory status, which medication should you be prepared to administer to the newborn infant with respiratory distress syndrome (RDS)? Option C: Exosurf neonatal is a form of synthetic surfactant. An infant with RDS may be given two to four doses during the first 24 to 48 hours after birth. It improves respiratory status, and research has shown a significant decrease in the incidence of pneumothorax when it is administered. A nurse in the newborn nursery is monitoring a preterm newborn infant for respiratory distress syndrome. Which assessment signs, if noted in the newborn infant, would alert the nurse to the possibility of this syndrome? Option D: The infant with respiratory distress syndrome may present with signs of cyanosis, tachypnea or apnea, nasal flaring, chest wall retractions, or audible grunts. 1. A nurse is preparing to give a lung surfactant to a 36 weeks old baby with a respiratory distress syndrome. Which of the following is the correct route of administration? Option D: Lung surfactant is instilled through the catheter inserted into the newborn’s endotracheal tube. Options A, B, and C: Options B, C, and D are not the routes of administration for this medication. 2. A patient with acute respiratory distress syndrome (ARDS) is receiving oxygen by a nonrebreather mask, but arterial blood gas measurements still show poor oxygenation. As the nurse responsible for this patient’s care, you would anticipate a physician order for what action? 2. Answer: B. Perform endotracheal intubation and initiate mechanical ventilation. 3. The high-pressure alarm on a patient’s ventilator goes off. When you enter the room to assess the patient, who has ARDS, the oxygen saturation monitor reads 87% and the patient is struggling to sit up. Which action should you take next? Option A: Manual ventilation of the patient will allow you to deliver a FiO2 of 100% to the patient while you attempt to determine the cause of the high-pressure alarm. Options B, C, D: The patient may need reassurance, suctioning, and/or insertion of an oral airway, but the first step should be an assessment of the reason for the high-pressure alarm and resolution of the hypoxemia. 4. To improve respiratory status, which medication should you be prepared to administer to the newborn infant with respiratory distress syndrome (RDS)? 5. A nurse in the newborn nursery is monitoring a preterm newborn infant for respiratory distress syndrome. Which assessment signs, if noted in the newborn infant, would alert the nurse to the possibility of this syndrome? 5. Answer: D. Tachypnea and retractions. Comment:Marianne good afternoon and happy new month I want to commend you for the good work you are doing.I know it is real hardwork to combine all these aspects and still do them well. I want to say,well done .